This is a horror novel unlike anything I’ve ever read. From the very first sentence, the eerie, creepy vibes will have you turning pages to find out what happens next. An intriguing premise and highly readable prose make this a book you’ll remember. Following ex-rocker Jesse from a one-night reunion with his old band into a nightmarish ordeal that may or may not have something to do with a cursed book given to him by his old bandmate, Will Haunt You will have readers questioning what’s real and what’s a figment of the darkest parts of Jesse’s imagination. The ideas are fresh and unique, and Kirk is excellent at making the hair on the back of your neck stand up, but I thought that some of the story was disjointed and at times confusing. That also added to the aura of dread overall, and there were some great twists. 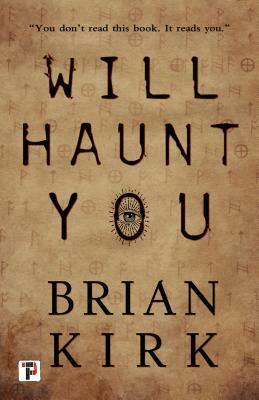 I would recommend this book to horror fans looking for something a little different. I’m excited to see what Brian Kirk writes next. Many thanks to Flame Tree Press and Brian Kirk, as well as NetGalley, who provided me with a copy of this book in exchange for an honest review. All the thoughts and opinions expressed in this review are my own.